Welcome meeting on Monday 3rd September at 2:00 PM, first lecture on Tuesday 4th at 8:00 AM. The PSA Master programme focuses on fundamental and applied research programmes conducted at facilities like large centres in particle physics (for instance LHC at CERN in Geneva, or JUNO in CHina) or in nuclear physics (for instance SPIRAL at GANIL in France) and on the strong connections with modern cosmology and astrophysics. The two-year Master programme includes advanced lectures on theoretical methods and experimental techniques and requires active participation of the students in research projects to prepare them for a professional career in science. Student can enter the programme directly in second year, see the admission page. Learning by active participation in research The educational programme is built around the wide range of research activities at the Institut Pluridisciplinaire Hubert Curien (IPHC) hosting the second year specialisation of the Master. This assures close contacts between among students and scientists participating in the Master programme via lectures and research projects proposed to the students. In addition to theoretical physics, the institute has a long tradition in developing state of the art instrumentation for ambitious research programmes within large international collaborations. Scientists of the IPHC conduct world-class research in all current major centres and domains of subatomic physics. The fundamental and applied research programmes in particle and nuclear physics and the strong connections with modern cosmology and astrophysics define the basic content of the second year of this Master. A two-year programme The first year of the Master aims at providing a solid and broad base in theoretical and experimental physics and is shared by all specialisations : Condensed Matter and Nanophysics, Astrophysics and Physics of Radiation and Imaging techniques. Students from other universities, who have acquired this base, can join the Master Programme directly at the second year, where the specialisation takes place. In the second year the students attend advanced lectures in particle and nuclear physics and cosmology. The second semester is devoted to a full time research project (Internship or Master thesis). 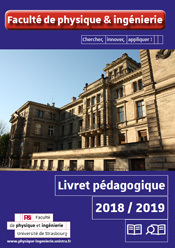 This phase represents a crucial step in our educational approach driven by active participation in research and aims at high qualification to prepare a PhD thesis in France or abroad.